Shelby American debuted two new cars at the 2013 Detroit Auto Show, and they couldn’t be more different from each other. One is a Ford Mustang with a wide body kit; the other is a Focus. The former shouldn’t raise any eyebrows, but Shelby isn’t normally associated with compact front-wheel drive hatchbacks. The brainchild of Cobra-creator Carroll Shelby is known for building high performance Mustangs, but the company decided to take stab at another, more affordable, Ford product. 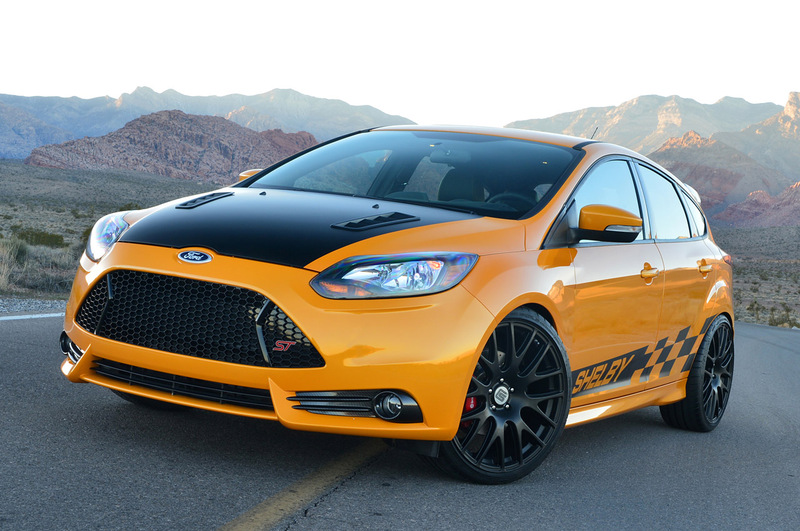 The Shelby Focus is a tuned version of the ST performance model. Shelby’s Las Vegas “skunkworks” added Ford Racing suspension, a Borla exhaust systems, and bigger brakes with drilled rotors. The exterior gets a big dose of attitude with Shelby graphics, a blacked-out and vented hood, and a hydro-carbon rear spoiler. Three graphics packages will be offered, including traditional stripes, the checkered pattern seen on the yellow Detroit show car, or “competition graphics.” There’s also plenty of Shelby branding in the customized interior, including a shifter with a Shelby badge. One thing is missing, though: horsepower. Shelby says it is developing performance options for the Focus ST’s 2.0-liter turbocharged four-cylinder, but for now the only changes under the hood are “stylish hydro-carbon components.” Buyers will have to make do with the stock ST’s 252 horsepower and 270 pound-feet of torque. A Shelby Focus may seem shocking but, as with most things automotive, there is nothing new under the sun. Carroll Shelby collaborated with Chrysler on a performance version of the Dodge Omni, the GLH (Goes Like Hell). What is surprising is that Shelby’s company would add some bolt-on performance parts and stickers to a car without even touching the engine. This could be an attempt to make the Shelby Focus ST more affordable, but it will still cost $14,995, on top of the price of a stock 2013 Focus ST.
At the other end of the spectrum is the 2013 Shelby Super Snake Wide Body. As before, the Shelby takes a stock GT500 Mustang, and increases power from 662 hp to 850 hp. 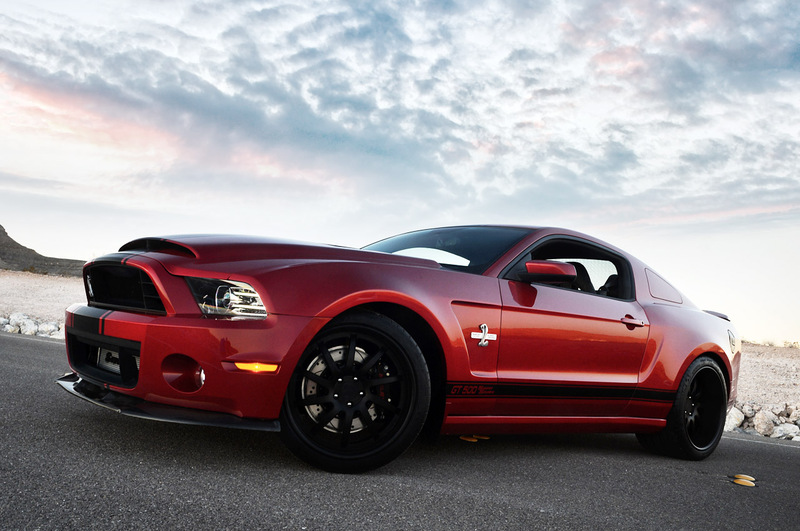 For 2013, a wide body kit gives the Super Snake an appropriate amount of visual muscle. The flared fenders cover massive 10-inch front and 13-inch rear wheels. The full 850 hp package adds $39,995 to the cost of a stock 2013 GT500 Mustang, and the wide body kit costs $14,995. That means someone could almost buy another stock GT500 (base price: $55,445) for the cost of the Shelby add-ons. It’s hard to top a 662 hp car with a claimed top speed of 200 mph, but adding and extra dollop of power and an aggressive body kit is a good way to try. It will be interesting to see if Shelby offers the wide body kit on the 1,000 hp Shelby 1000. Shelby is synonymous with American performance, but its 2013 Detroit presentation was more about style than substance. That’s fine for the already-impressive Super Snake, but maybe Shelby should give the Focus a little more power to match its racy looks.